A 65-year-old man was referred to our chest clinic for preoperative assessment before undergoing repair of a fractured neck of his femur. His chest radiograph was abnormal (figure 1). Figure 1: Chest radiograph showing right lower lobe consolidation. He complained of cough with minimal mucopurulent expectoration and fever, which had not responded to a ten-day course of gatifloxacin, 400 mg daily.He was a non-smoker and had no significant medical or surgical illness in the past. He had worked as a glass blower (mouth blower) for 40 years and had retired from work 5 years before this assessment. The glass blowing was done in a workshop with a glass pipe made of borosilicate (figure 2). This pipe was used to blow the molten glass to give the desired shape to make scientific glass equipment like test tubes and flasks. The glass tube to be blown was loaded on the borosilicate glass pipe. The glass is then melted by holding it over an arc light generated by flaming a mixture of air with liquefied petroleum gas (figure 3). The molten glass is then blown by mouth to give the desired shape (figures 4 and 5). Figure 2: Borosilicate pipe used for glass blowing. Figure 4 & 5: Worker blowing the molten glass to give it the desired shape. On physical examination, tubular bronchial breath sounds and crackles were heard in the right lower interscapular and infrascapular region. His hemoglobin was 12.8 g/dL; his leukocyte count was 12,400 / mm3 with a differential count of neutrophils 70% and lymphocytes 30%. Sputum smear and culture was negative for bacteria, acid-fast bacilli and fungi. Arterial blood gases on room air showed a pH of 7.39, PaO2 of 78 mm Hg, PaCO2 of 44 mm Hg, and HCO3 26 mmols/L. A computerized tomography (CT) scan ofthethorax (figure 6) showed consolidation in the right lower lobe. There was no hilar or mediastinal lymphadenopathy or narrowing of the right lower lobe bronchus. Another chest radiograph and CT, after completing the course of antibiotics, showed no change in the consolidation. The patient underwent a CT-guided fine needle aspiration biopsy, which showed a low-grade lymphoproliferative disorder. Immunohistochemistry showed CD20-positive, CD43-positive, CD5-negative, CD10-negative, and Bcl 2-negative antigen markers. He refused surgery and was treated with cyclophosphamide, vincristine, and prednisolone. After 3 cycles of chemotherapy the patient developed an acute myocardial infarction, which was treated successfully. Further chemotherapy was not given. 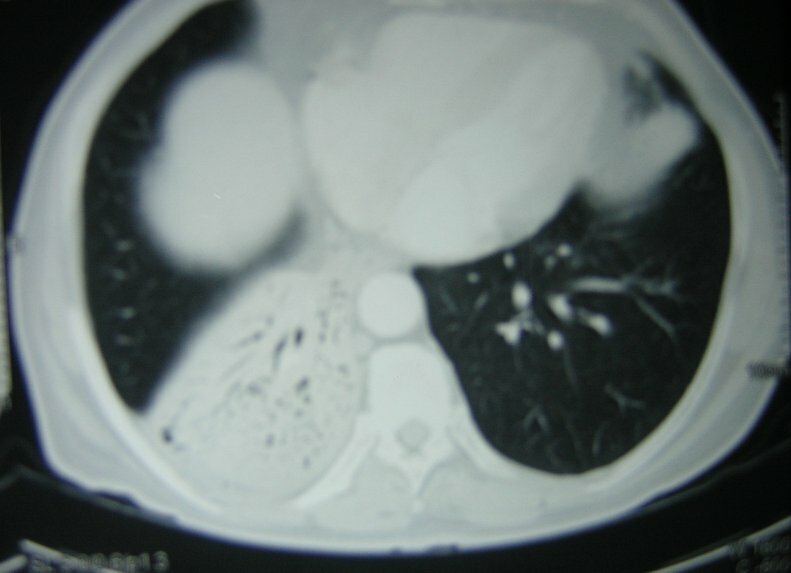 His chest radiograph showed clearing of the lung lesion (figure 7). Presently he is well with no recurrence and takes only low dose aspirin and isosorbide dinitrate for his ischemic heart disease. Figure 7: Chest radiograph showing clearing of the right lower lobe opacity after chemotherapy. Given the history, clinical findings, chest radiograph, and CT scan images, which one of the following is the LEAST likely diagnosis? The chest radiograph and CT scan show an opacity with air bronchogram indicating a consolidation or pneumonia picture. Only silicosis of the listed causes does not generally cause lower lobe consolidation. The chest radiograph showed no evidence of resolution after an adequate course of antibiotics characterizing this as a non-resolving pneumonia. Infection caused by resistant organisms, development of resistance during therapy, or superinfection. Consider unusual bacteria, mycobacteria, fungi, and parasites. Malignancies that occupy air spaces such as bronchioloalveolar carcinoma, lymphoma, and leukemia. Inflammatory and fibrotic lung disease that includes diffuse interstitial pneumonitis (DIP), hypersensitivity pneumonitis, collagen vascular disease, cryptogenic organizing pneumonia, and eosinophilic lung disease. The immunohistochemical findings in this case were consistent with extranodal, marginal zone B-cell lymphoma of mucosa associated lymphoid tissue (MALT) of the lung. The immunohistochemistry showed the B cell phenotype (CD19, CD20 positive) and excluded centrifollicular non-Hodgkins lymphoma (NHL)-B, mantel NHL-B and chronic lymphocytic leukaemia-type lymphoma by showing the lack of CD5 and CD10 surface antigens . Primary malignant non-Hodgkin's lymphomas arising in MALT develop most frequently in the stomach, but also in the bowel, salivary glands, larynx, thyroid gland, and lung [1,2,3]. Accordingly, when located in the lung, this lymphoma appears to arise from bronchus-associated lymphoid tissue (BALT) . The Revised European American Lymphoma classification and the World Health Organization in 1994 incorporated mucosa-associated lymphoma as a distinct subgroup of non-Hodgkin lymphoma under the term extranodal, marginal zone lymphoma of MALT. Primary pulmonary lymphoma is defined as a clonal lymphoid proliferation affecting the lungs or bronchi in a patient with no detectable extrapulmonary involvement at diagnosis or in the subsequent 3 months. Primary pulmonary lymphomas are rare tumors comprising about 3% of all extranodal lymphomas, and only 0.5% of all pulmonary malignancies. Which one of the following manifestations is LEAST likely to be seen in glass blowers? b) Malignancies of the gastrointestinal tract (stomach, colon, oropharynx). Pleural involvement is rare in glass blowers, although it may be involved secondary to malignancies at other sites. An increased risk of lung, stomach, colon, and bladder cancer has been reported in previous studies among glass workers. Metallic compounds and other agents used in the manufacture of glass are likely to be responsible for the cancer risks observed in glassworkers. Four cohort studies of workers involved in glass manufacture - one at a plant in Italy among art glass workers,  two at glass factories in Finland  and one in Sweden among art glass-workers  found increased risks for lung cancer. Another population-based case-control study in China found a significantly increased risk for lung cancer in female glass-workers and a nonsignificantly decreased risk in male glass, ceramics and enameled product workers . Which ONE of the following is NOT a characteristic CT scan appearance of MALTOMA of the lung? b) Multiple and bilateral alveolar opacities. The common radiographic appearances are pulmonary masses or mass-like areas of consolidation or nodules, unilateral or bilateral, and in peribronchial or bronchovascular distribution. Frequently, air bronchograms are seen within the nodules and masses. The patent airways within the consolidated lung appear dilated and, occasionally, can be mistaken for cavitation. Lymphadenopathy may also be observed on CT imaging. High-resolution CT scans may show areas of ground-glass opacity and peribronchovascular thickening at the tumor margins. [2,3,13] In the 11 patients reviewed by Kinsley et al,  the most common CT appearance of pulmonary mucosa-associated lymphoid tissue lymphoma was consolidation with air bronchograms, correlating histologically with a cellular lymphocytic infiltrate expanding the interstitium and compressing adjacent alveoli, producing air bronchograms. Which of the following is the usual treatment for this disease? The best answer is e.
In the absence of any prospective studies, the optimal therapy remains unclear. In most series, surgical resection, either alone or in combination with chemotherapy, has been the mainstay of therapy. Chemotherapy has also been used in patients with residual disease after resection or in those with extrapulmonary involvement. No difference in response rates was seen with single-agent chemotherapy or in multiple chemotherapeutic drug regimes. The prognosis is excellent for patients with localized MALT lymphomas. Most series have reported a 5-year survival rate of greater than 80% and a median survival time of 10 years. Local and extrathoracic relapse have been noted, making long-term surveillance necessary. Although transformation to high-grade lymphoma has been reported, these cases may represent large B-cell lymphomas that have been initially mistaken for MALT lymphomas. Cadranel J, Wislez M, Antoine M. Primary pulmonary lymphoma. Eur Respir J 2002; 20:750-762. Lee DK, Im JG, Lee KS et al. B-cell lymphoma of bronchus-associated lymphoid tissue (BALT): CT features in 10 patients. J Comput Assist Tomogr 2000; 24:30-34. O'Donnell PG, Jackson SA, Tung KT, et al. Radiological appearance of lymphomas arising from mucosa-associated lymphoid tissue (MALT) in the lung. Clin Radiol 1998;53:258-263. Pirastu R, Bartoli D, Battista G et al. Cancer mortality of art glass workers in Tuscany, Italy. Scand J Work Environ Health. 1998;24:386-391. Sankila R, Karjalainen S, Pukkala E. Cancer risk among glass factory workers- an excess of lung cancer? Br J Ind Med.1990;47:815-818. Wingren G, Englander V. Mortality and cancer morbidity in a cohort of Swedish glass workers. Occup Environ Health. 1990;62:253-257. Levin LI, Zheng W, Blot WJ et al. Occupation and lung cancer in Shanghai: a case-control study. Br J Ind Med. 1988;45:450-458. Isaacson PG. Mucosa-associated lymphoid tissue lymphoma. Semin Hematol 1999;36:139-147. Band PR, Le ND, Fang R, Gallagher R. Identification of occupational cancer risks in British Columbia: a population-based case-control study of 769 cases of non-Hodgkin's lymphoma analyzed by histopathology subtypes. J Occup Environ Med. 2004 May;46(5):479-489. Mao Y, Hu J, Ugnat AM, White K. Non-Hodgkin's lymphoma and occupational exposure to chemicals in Canada. Canadian Cancer Registries Epidemiology Research Group. Ann Oncol. 2000;11 Suppl 1:69-73. Lennart Hardell, Gunilla Lindström, Bert van Bavel, Mats Fredrikson, and GÃ¶ran Liljegren. Some Aspects of the Etiology of Non-Hodgkin's Lymphoma . Environ Health Perspect 106(Suppl 2):679-681 (1998). Exposures in the Glass Manufacturing Industry. International Agency for Research on Cancer (IARC) - Summaries & Evaluations. www.inchem.org/documents/iarc/vol58/mono58-4.html, accessed on 2nd November 2005. Sankaranarayanan V, Zeidalski TM, Chitkara RK. A 55-Year-Old Smoker With a Persistent Right Lower Lobe Infiltrate. Chest. 2005;127:2266-2270.